Stephens and Emmett are not your usual UFC main eventers but get a big spot here thanks to their recent performances. Stephens destroyed Doo Ho Choi in two rounds last January while Emmett knocked out perennial contender Ricardo Lamas in Winnipeg back in December. The two got the most out of their impressive knockout victories. This isn't Stephens's first main event although "Lil Heathen" is only 4-4 since he last fought five rounds: a unanimous decision loss to Cub Swanson back in early 2014 while Emmett has been largely unknown although he trains at the prestigious Team Alpha Male gym and is teammates with UFC Hall of Famer Urijah Faber. While both fighters possess enormous knockout power, the majority of their fights still end in a decision. For entertainment's sake, everyone hopes this fight ends in a vicious knockout but we wouldn't put our money on it. A lot of factors go into predicting a knockout. It goes beyond simple punching power and fighting style. Stephens has deadly power but only has two knockouts in his last ten fights. This is due to him being primarily a striker. If Stephens mixed his style more, he could open up his opponents but as a pure striker, his opponents anticipate his heavy shots. Stephens (-155) fights a good pace but doesn't land that many shots (3.07 per minute). He also doesn't absorb that many (2.71) since most of his opponents fear his power. Emmett (+125) will have wrestling on his side and he could potentially keep Stephens honest with his threat of takedowns. The Californian lands 2.09 takedowns per fight at 52.94 per cent accuracy. 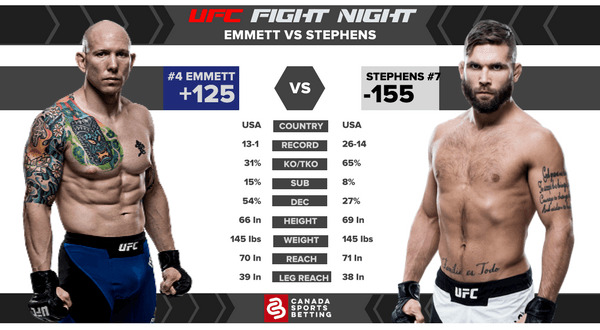 If the fight gets too hairy for Emmett, he'll shoot for takedowns and Stephens will be ready for it. He knocked out Dennis Bermudez with a flying knee as he shot for a takedown. Emmett best be wary of this. This fight is hard to predict but both fighters will respect each other's power leading to a slow-paced fight that could even go to a decision. Both Emmett and Stephens are tough and a potential title shot could make them even more defensive. Prediction: betting on a fighter here is tough but lean on Jeremy Stephens as he is more diverse and has decent takedown defence. He'll also push the fight more. The bet to really consider is the over 3.5 rounds (-115) as both guys are tough and could figtht a slower pace over five rounds. Lock it Up! For Alan Jouban (-270) who will beat up Ben Saunders (+195); Jouban badly needs a win and the UFC has offered Saunders, who is the inferior striker, shopworn and not that durable. Saunders is a submissions expert but Jouban is a BJJ brown belt and should neutralize Saunders wherever the fight goes. Who's A Good Dog? She's in for the fight of her life but Tecia Torres (+235) is too good for this price. Jessica Andrade (-325) has been a wrecking ball at 115 and is the likely winner but Torres's solid all-around game and high fight IQ will keep her in this fight. She's a live dog and can outsmart the ferocious Andrade. Just Say No: to Angela Hill (-160) versus Maryna Moroz (+125); Hill is the superior striker but pressure fighters like Moroz can overwhelm her. This fight is also likely to hit the scorecards and it's hard to see either fighter thoroughly dominating to be confident. Pass! The only thing better than a free UFC card is making some coin while watching. Canadians are still infatuated with MMA and go to these online sportsbooks for all their betting needs. Make sure to read our reviews and find the bets book for you before depositing money.